Canine Aggression Issues with Jim Crosby: Force, prisons, and training. Salvation or perpetuation of the status quo? Force, prisons, and training. Salvation or perpetuation of the status quo? I have been watching the developing stories from California about the incident where Cesar Milan seems to have placed an animal aggressive dog and pigs in close proximity without adequate safety measures. The situation is predictably, and avoidably, stressful for both animals. Public reaction has been a roller coaster ride. The American Humane Association and tons of trainers have spoken out against the incident, and tons of loyal fans have responded just as energetically. I wrote a piece about my method of how I would handle a similar situation. And my piece is just that: my way. Not Cesar's. Maybe not yours. I want to make one issue clear: I am NOT the "anti-Cesar". I am not trying to be. There are plenty who have taken on that mantle, some for honorable reasons and some, probably, less so. I have nothing personal against Mr. Milan. We have met briefly once and he was personable and pleasant. His public presentation was very well done and entertaining. He has, for better or worse, gotten lots of people passionate about interacting with their pets. That isn't all bad. Where we differ are three basic points: educational background, personal style, and the use of science-based methods. We also differ evolutionarily, if I can use that term in this context. I have changed over the years. I have learned from behavioral science, adapted my methods, sharpened my eye and my skills, and looked beyond "the way we've always done it" to new horizons. Professionally I don't feel that Mr. Milan has. To illustrate I want to comment on another piece of footage from his celebratory 100th episode. The footage link is here. OK. This is nice footage of a program in a prison where inmates are helping save dogs' lives by training them for adoption. Those who know me know that I am deeply involved in a similar program called TAILS (Training Animals and Inmates in Life Skills) here in North Florida. Such programs are literal life savers, for dogs and humans. Prison is a tough place to be. Life isn't easy and comfy (and isn't supposed to be). A culture of violence, intimidation, and fear is common in many such institutions. Survival may be dependent on being the "alpha" in the cell block. But besides serving to secure those who simply can’t function on the outside, the purpose of prison is supposed to be providing 1) clear consequences for bad choices, and more importantly 2) teaching people to change and make better choices. Inmates are intended to learn compassion and empathy for others instead of learning to be someone out of Mad Max. The training methods Mr. Milan espouses are based on the negative culture that already exists in prison: impose your will, through intimidation, on someone weaker than you. That is what we should be eliminating among the inmate population. That is what got the inmates there in the first place. And that is not what we should be teaching inmates as a strategy for success. Instead, we must replace fear and intimidation with positive reinforcement and instructive guidance. We need to show the inmates the value of being a caring, positive role model rather than how to be a better bully. They have had enough bullying. It is time for them to learn a new way of life. Dogs treated as respected companions, and the methods of science-based dog training, can teach that new way of life. I don’t mean leap into the trap of unbridled permissiveness: that doesn’t work. 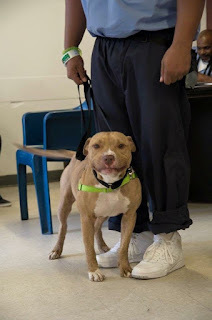 Inmates, dogs, and indeed most of us, thrive in an environment where there are clear, fair limits. The limits become self imposed and internalized within a positively based structure instead of being forced upon us. We, and dogs, learn which behaviors provide positive outcomes over the short and the long term. Training dogs with positively based methods teaches inmates to set limits without violence, and to be compassionate and empathetic without preaching. They can experience how these methods work, and how the dogs can bond with them without judgement. Take a close look at this video and we will break down what is happening versus what needs to happen. The prison segment starts at about 07:50 in the episode. They are at a Womens' correctional institute out west. The segment is cited as an excerpt from Episode 41 of the show. This may be Cesar’s Way, and there are certainly trainers who do this. This is not my way. I would prefer to gain the dog’s trust, use rewards or lures, and show them that they can move forward without negative consequences. Then mark and reinforce the movement. Make training fun! Let the dog have a good time! Forward movement is a reinforcer for a dog - as long as the dog isn’t terrified. Show them that they can move with confidence and a sense of adventure. What we see here is not establishing a leader. It is avoiding being strung up. Toenail sensitivity is very common. After all, cut a little too close a single time and it hurts. Dogs aren’t stupid-they learn what hurts. This is a situation where basic conditioning is the easy way: reach for the paw, dog doesn’t react, dog gets treat. Touch paw, dog allows touch without negative reactions, dog gets treat. Pick up paw, dog gets treat. And on it goes - lather, rinse, repeat - until you are touching the dogs paw with the clippers, dog is calm, dog gets three treats! We clip one nail successfully: big jackpot, dog gets to get up and run amok, chase the ball; its party time! And then later, or the next day, we start over. If we hit a snag, we stop, let the situation calm, repeat a lower level of conduct that we can reward, and quit for the day. Start over tomorrow at a little less challenging level. No, this isn’t quick and makes terrible TV. But no one gets bitten, and we establish trust without using violence. Now let’s dissect Cesar’s Way. At. 10:12, as Cesar presses Bendi down on his side, Bendi yelps, tries to get up, and then rapidly snaps several times at Cesar’s hands. Cesar and the dog then get into a quick wrestling match, with Cesar forcing the dog down. At 10:18, Cesar has forced Bendi down on his back. While restraining Bendi, Cesar says “…right now I am just calming him down.” Yet there is no marker for the instant that Bendi gives the first indications of relaxing. Instead, Bendi has no guidance and stays aroused and tense. Cesar has already been bitten and asks for a napkin. We are less than three minutes into the session and we already have resistance, fear, and blood. The narrator’s voice over adds the drama: “The attack happens in an instant. In less than three seconds, Bendi has bitten Cesar three times.” This is somehow good? We proceed a bit and at 10:45 Cesar has Bendi held down and is telling the handler “You can’t let her go. If you do and she wins she becomes more powerful.” More powerful than what? A bigger bully? Is this a video game where you amass “power units” or something? Cesar then has the handler start to trim the nails of this restrained, fearful dog. Bendi snaps again, eyes wide in fear, teeth fully exposed and lips retracted and tense. Cesar doesn’t guide behavior-he holds Bendi down and gives his trademark negative marker of “psssst!”. When Bendi stops snapping and gives an opportunity to verbally reinforce with a positive marker, there is no response from Cesar. Instead he presses on to the second nail. With this nail, when Bendi doesn’t snap because he is restrained, Cesar gives the same negative “pssst!” marker. Bend wrinkles his nose, but holds himself back - and gets nothing positive to let him know that not biting is good. Same reaction for restraint as for biting. Bendi is now confused, and confusion adds to stress. We then segue (thankfully) to friendly groups walking and the episode goes on to how “rewarding” this experience was for Cesar. I am sure it was. Working with prison animal programs is greatly rewarding. The programs profoundly affect the lives of humans and animals that may not otherwise get a second chance. The effects ripple outwards farther than we think: one person becomes the model for family and friends, and then their families and friends, and soon we have a wave of second chances washing across a wider population than we can touch individually. Inmates in prison often come from homes and situations that do not reward or encourage compassion and caring. These programs change that. My work has opened my eyes in new ways. The feeling of seeing someone teaching a dog to succeed and learning themselves that they too have the potential is amazing. Where I once sent people in, I can now help them get out and not return. Prison programs succeed because of compassion, not because of force or intimidation. They are the antithesis of violence. 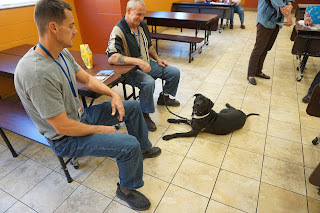 The difference is visible when you walk into a dorm or residential block that houses inmate/dog teams. The rest of the institution may be a jungle: their block is an oasis. Fear may surround the clearing, but here the atmosphere is calm. Teams work together to solve problems rather than gangs looking for turf. Cesar’s methods flat out miss the mark. Instead, fear is a constant companion. Muggings happen daily. Pup wonders if today is another day their “trainer” places them into the “just kill me” helplessness that is touted as “calm submission”.